D.G. Driver loves to write about diverse characters dealing with social or environmental issues. 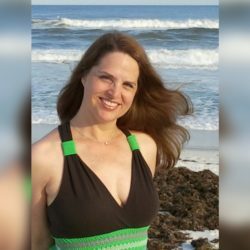 She primarily writes contemporary fantasy (or urban fantasy), such as her Juniper Sawfeather Novels young adult trilogy and her romantic ya ghost story Passing Notes. She’s been writing and publishing for 22 years. When she’s not writing, she is teaching, watching TV, reading or possibly singing musical theater songs at the top of her lungs. Now… on to the six questions! If you have any questions of your own, please leave them in the comments, and hopefully H.L. will drop by and answer them. In addition to writing, I am an actress. My degree is in theater, and I pursued it professionally throughout my twenties. Now I perform as a hobby in local theater productions. Primarily I do musical theater, and I have to say the process of rehearsing a show: learning the dance numbers, understanding the harmonies of the songs, getting the blocking, adjusting the blocking when the set gets built, understanding the meaning of all my lines and then memorizing them, and of course adjusting what I want to do to what the director wants me to do – all of that is similar to writing a book and getting it published. The difference is that it is faster, a little less painful, and you actually get to hear applause on opening night instead of that deafening silence when a book goes live on Amazon. All that said, I love writing a little more than performing, maybe because I get to play all the parts. My first novel was a horror novel, and it was an impulsive idea. I was 18. A group of my friends (all boys) and I took to wandering around this old part of my hometown and making up ghost stories about it. One evening we all joked about how our ghost stories would add up to a great book (we were all big fans of Stephen King’s It at the time). Well, I spent the next four years using my breaks from college to work on this book. I completed it, and there are parts of it that are pretty decent. As a whole, it’s not, so I’ll probably never publish it. After college, I dabbled with more short stories and a children’s novel, but it was when a local theater company asked me to write a play for them that I really got hooked. I’ve been writing with determination ever since. I have a dedicated office in my home where I do most of my writing. When I’m really in a crunch, I will take my laptop and sit at a park or somewhere that I can’t connect to the internet and get distracted. I write what I call “chunky outlines” where I plot the book by writing paragraphs of what I expect to happen in each chapter. I will do some initial research. 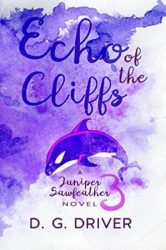 For example, for each Juniper Sawfeather book I needed to know what environmental cause she was going to be fighting and what American Indian myth would go along with the story I wanted to tell. Otherwise, I research things as they come up. My plots often change in the process of my writing. 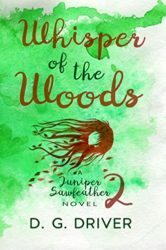 I would love to see the Juniper Sawfeather Novels made into a TV series. I think fans of shows like X-Files, Supernatural, or Grimm would get into this teen girl who finds mythical creatures in our world. Battling rejection and writing block fears. I’ve had some successes, but nothing too big. I’m still wishing for that New York publishing gig. I write about mermaids, monsters, and ghosts. I like writing contemporary fantasy the most. I’d like to write more, but I haven’t the time. Writing full time is a dream of mine. And make me feel what I’m doing is right. So, I keep plugging along, book after book. Won’t you consider giving my work a look? I’m picturing 3 girls between the ages of 13 and 20. 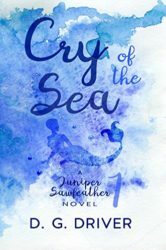 “Well, that’s a little like my young adult novel Cry of the Sea, about a teenage girl who discovers real-life mermaids in an oil spill and find out there are more of them who are in danger of being killed. Sound like something you’d want to read? You should check it out. It’s at Amazon.” (Handing out bookmarks). Have I done this before? Yes, I have. I love your elevator pitch! And Cry of the Sea is one of the best books I’ve ever read.